Roll off Trailer Manufacturer, BENLEE has roll off container trailers for sale and in stock. This includes Tri axle 80,000 GVWR trailers and roll off truck replacement trailers, the Super Mini. Some call these roll off dump trailers, or roll off container trailers. We sell them in Texas, California, J, South Carolina and more. We even have a fleet of rolloff trailers in Hawaii! Call Jeff at 734-722-8100 for a quote. 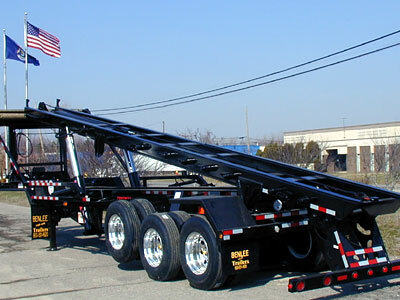 BENLEE is the #1 roll off trailer manufacturer in North America, selling to Canada and Mexico as well. Our trailers carry dumpsters of all sizes! We have a roll off trailer for every application. Safety is #1 when it comes to roll off trailers. We install Wheel Checks on every unit we sell. Wheel checks are great indicators of loose bolts. A great product!